First, the Daily Pilot announced this afternoon that a new Editor has been named to replace the departed Brady Rhoades. John Canalis, most recently of the Long Beach Press-Telegram and a former Daily Pilot reporter, will report to work on Monday, February 22nd. You can read Joe Serna's article HERE. I did a little background checking on Canalis and am encouraged by the depth and quality of his experience. He gets high marks from folks who worked with him in the past. We here at A Bubbling Cauldron wish him the very best luck as he dives into this pond next week. At the Costa Mesa City Council meeting last night there were few surprises, including the fact that it started late, which has become the norm recently. 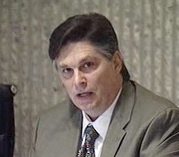 The Public Comments segment was a little more interesting than usual, even though the regular infestation by The Mouth From Mesa North persists. Several folks stood at the podium to speak on behalf of the numerous "medical" marijuana dispensaries in Costa Mesa. I had the impression that, if one were in attendance at this meeting you might have perceived a special "fragrance". If one closed his eyes during most of these speaker's presentations you'd swear you were listening to Sean Penn as Jeff Spicoli in the movie "Fast Times At Ridgemont High", dude. 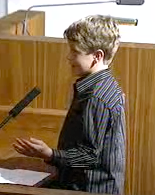 A high point for me, and a terrific counterpoint to The Mouth, was watching young Ben Swanson stand and tell the council they should stop the sale of the Fairgrounds because it's for the kids. Young Ben is the youngest of Katrina Foley's two sons. Looks like my Republican buddies have yet another generation of articulate, motivated liberals to worry about. As anticipated, the council voted to place the issue restricting the use of the Fairgrounds for anything other than it's current uses on the June ballot. This followed the codification of the ordinance that locks in the current use in the General Plan. If the electorate passes this issue in June any potential developer is going to have to convince the voters - not just a future council majority - to change the zoning on that 150 acres. Even Jim Righeimer, who looked like he crawled out of bed to attend the meeting, stood to praise the council for their actions last night. Also as expected, the perpetually petulant Eric Bever attempted to have a re-hearing of the issue declaring the entire city a "recovery zone" for the purposes of facilitating the acquisition of Federal Stimulus Funds by a couple local businesses attempting to jump-start their recovery. He was in such a hurry on this issue that he called for a vote before his fellow council members had finished discussing the subject and before any resident had a chance to address it. But then, even though he's been on the council for more than five years, you can't expect a guy with such limited intellectual resources to follow procedures, can you? Nah! His bid was rejected, 3-2, with currently unemployed Mayor Allan Mansoor joining him on the short end of the vote. Frustrated by this decision, Bever even attempted to have his neighborhood exempted from the "recovery zone" designation after the vote was taken. I'm sure he went home and sulked the rest of the night.